SPACE STATION NATHAN: Catch Up Post! 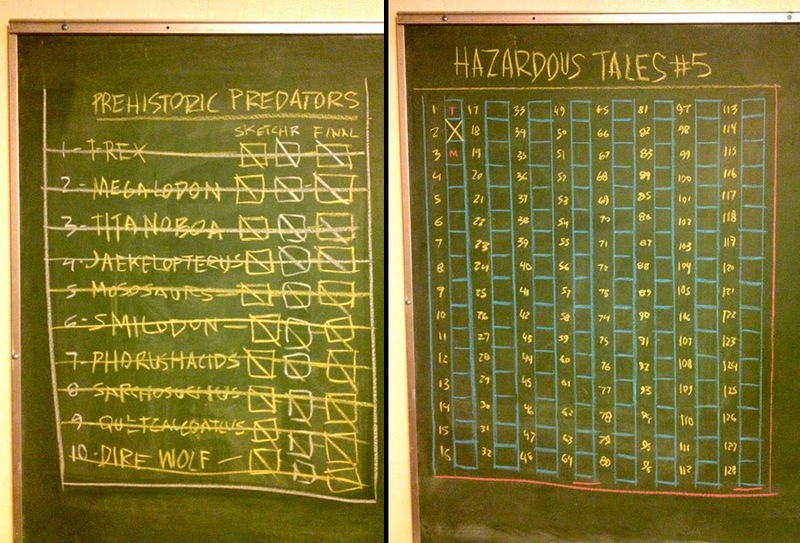 For the second time, a Hazardous Tales book has cracked the New York Times Best Seller list. 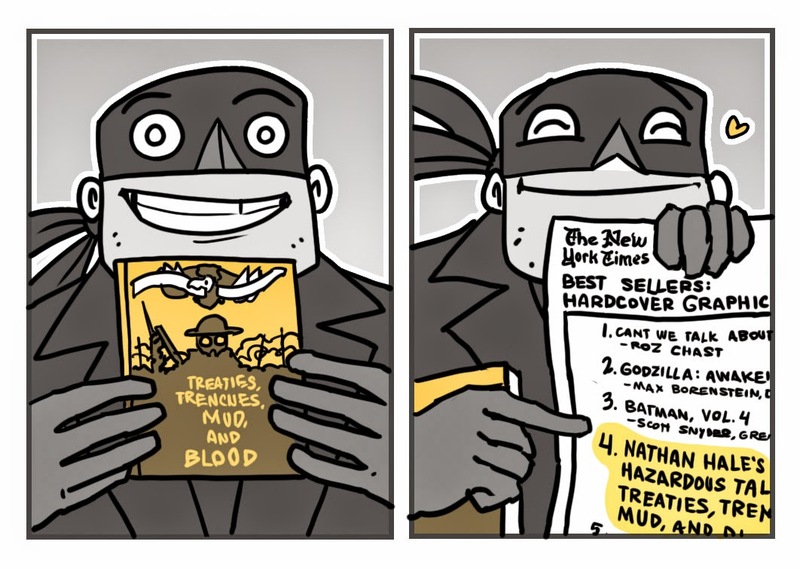 TREATIES, TRENCHES, MUD, AND BLOOD debuted at #4 on the Hardcover Graphic Novel list! Thank you so much for pre-ordering and buying the book at launch. You readers are the ones who put it there. Hooray! PREHISTORIC PREDATORS, a Scholastic book I did some illustrations for is finished, and drawings for Hazardous Tales book #5 start TODAY. The deadline: mid-August. We want book #5 to land on shelves in March 2015. It's going to be a drawing-drawing-drawing summer. If you missed it, Comics Alternative did a great interview podcast with me about Hazardous Tales. We talked about some series secrets: the mysterious narrator idea before Hale, Provost, and Hangman came along, as well as the crazy original plan for book #4--it wasn't WWI! and many other unknown tidbits. Tune in here: Comics Alternative Podcast. One last bit of news: The nominees for the Kids Comics Awards have been announced. DONNER DINNER PARTY has been nominated TWO times! For Favorite Non-Fiction Graphic Novel, and for Grossest Thing in Comics! All children can vote HERE. And please do! I'm up against Fregley's Gum-Chewing Belly-Button in the Grossest category. I'm going to need all the votes I can get! That is a lot of boxes. Glad we're getting more NHHT, but your hand is going to be tired. My kids and I are into graphic novels. We've enjoyed Calamity Jane and Rapunzel's Revenge. Recently while they were at the library looking for books, I saw the Donner Dinner Party in the kids' graphic novel section and picked it up for myself. I found it hilarious as well as super-informative. I can't wait to read your other books in that series now that I know it exists. History, ho! Recently while my kids were looking for books at the library, I happened upon the Donner Dinner Party in the kids' graphic novel section. I picked up immediately and was not ashamed to check it out for myself. We had read your previous books (Rapunzel & Calamity), but I hadn't connected this was your doing. I was delighted with the historical story and humor. I can't wait to see your other books in that series now that I know it exists. Nathan: Met you at ALA Las Vegas. There's pictures of Harriet T's Bucktown Village Store in Smithsonian Magazine story http://www.smithsonianmag.com/travel/on-the-trail-of-harriet-tubman-146048/ If you click through the pictures, the store has been restored (painted yellow) and has done some fixup work inside (last picture in Photo Gallery). I think when I saw it about 10-15 yrs ago, it was boarded up, faded, but advertizing the owners' kayak rental business on the side. The duck decoys in the store aren't wouldn't have been sold much in the 19th c. Most folks carved their own and duck hunting as eastern shore business came into play with massive planting of corn fields well after the civil war. P.S. I just finished the Donner Party book -- and will take it over to Marston Middle School once school resumes in Sept. I didn't skip forward to page 113. Have you visited Donner Memorial State park north of Lake Tahoe? Hope they will stock your book in the visitor center/museum there. in Maryland" Bucktown if that web address doesn't work right. No need to post my comments, just using your comments area to send you info.